Outdoor Service - Sunday, August 25, 2019, at 10:30 a.m. The last Sunday of August the worship service is held outdoors on the lawn adjacent to our fellowship hall. A fellowship meal follows at noon. Activities are planned for all ages. Oak Grove has strong ties to Central Christian School and Mennonite Colleges. We invite a Mennonite educator (often a College President) to speak and celebrate the gift of Christian Education for our children and youth. Harvest Home Sunday - Sunday, October 6, 2019 with Guest Speaker, Jeff Hochstetler, Family Life Minister at Berlin Mennonite Church, Berlin OH. “Harvest Home Sunday,” an autumn tradition at Oak Grove, had its beginnings when many members were engaged in farming. The season of harvest was a time of celebration and acknowledgment of our abundance and God’s blessing in our lives. Sharing this bounty with those in need was also the purpose of this special Sunday. Members brought fresh produce from their fields and gardens and home-canned fruits and vegetables from their kitchens. These were collected at the church and then distributed to street ministries and food pantries. Family and friends living out of the area have been invited back “home” to worship and enjoy the day together. A carry-in dinner has been held after the worship service. Fall decorations are a part of the tradition and add beauty to the church and fellowship hall. As lifestyles, professions and food restrictions at distribution places have changed, grocery items and offerings of money have replaced the fresh and canned produce. Once a year Oak Grove Mennonite includes a time of remembering those who were members of our faith community who died in the previous year. Family members are invited to light a candle in recognition of the life lived among us. Sunday, December 8, 2019, 5:30 - 7:30 p.m.
On the first Sunday of December, the church and fellowship hall are transformed into scenes reminiscent of the first century. Guided tours take small groups of people through the Christmas story beginning with the Annunciation, and ending with the Holy family in the sanctuary. Along the way children can see shepherds around the fire, animals, hear the angels sing, meet beggars, shopkeepers, peek in on the Wise Men, hear Herod’s edict and have time to sit quietly to reflect on the true meaning of the season. Admission is a donation to the local food pantry. 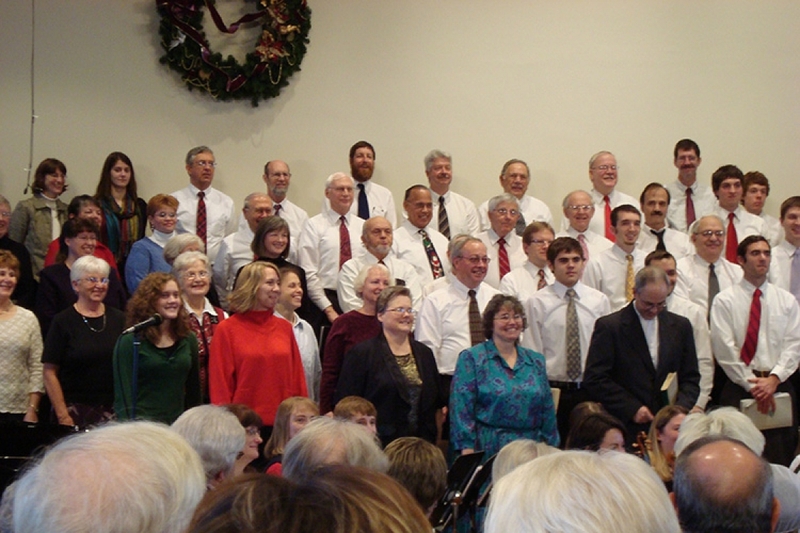 The Messiah - Sunday, December 15, 2019, 2:30 p.m.
For more than eighty years on a December Sunday afternoon before Christmas, Oak Grove Mennonite and community present Handel’s Messiah. Rehearsals are held Friday and Saturday evenings of performance weekend. Local and Oak Grove-related talent are recruited for orchestra and soloists. Anyone is invited to participate. Admission is free. A freewill offering is received. Tuesday, December 24, 2019, at 6:00 p.m.
A one-hour service of carols, reading and reflection prepare us to celebrate the Incarnation.